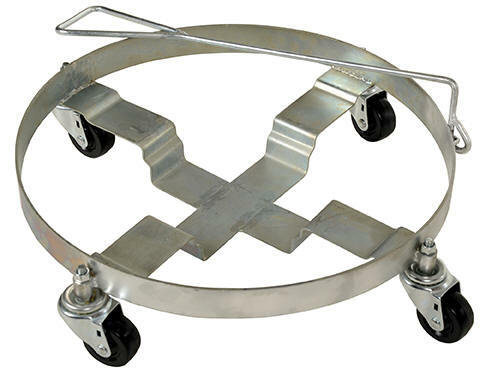 These multi-purpose dollies have a high polished bright zinc finish for corrosion resistance and (4) 3" x 1¼" swivel casters. Each unit comes with a 4 foot long nylon pull strap that helps in transporting down aisles or over thresh holds. Rubber-coated hook allows strap to hook on top of drum for storage. 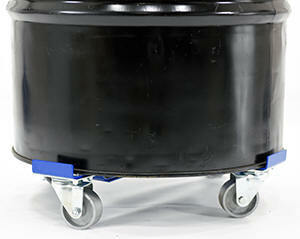 Quad Dolly, series DRUM-QUAD, can transport a 5 gallon pail, 30 or 55 gallon drum or LP gas tank. 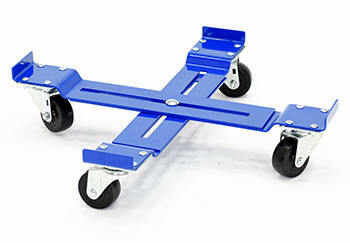 Available with hard rubber or cast iron wheels. Stainless Steel, model DRUM-QUAD-CS-SS, also available. 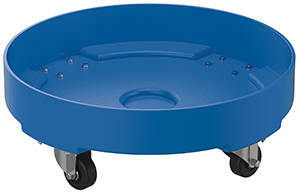 Tri Dolly, series DRUM-TRI, will transport 5 gallon pails, 30 gallon drums or LP gas tank. location. (4) 4" x 2" locking swivel glass-filled nylon casters with brakes standard. Tilt Drum 10° for better liquid extraction. Tilting feature is foot-operated and locks into place when activated. This feature only works with the outside/biggest drum that the unit will accommodate. 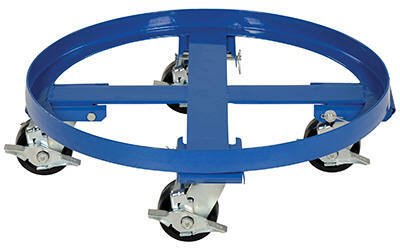 Drum-Quad, can transport a 5 gallon pail, 30 or 50 gallon drum or LP gas tank. 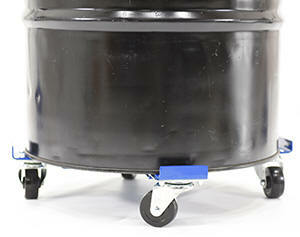 Drum-Tri, will transport 5 gallon pails, 30 gallon drums, or LP gas tank. 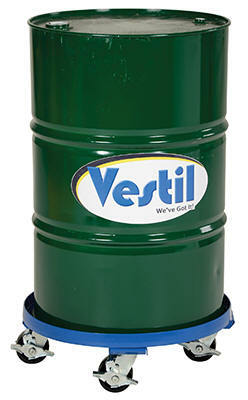 Drum-DHR-HR-TLT, will transport 5 gallon pails and 30 or 55 gallon drums. suited for both indoor and outdoor applications. Heavy-duty molded plastic (HDPE) construction with support rib understructure. Two tier design for use with both 55 and 30-gallon drums. 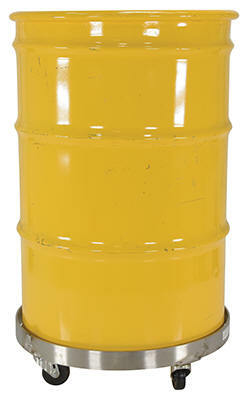 Usable opening is 23⅜" for 55-gallon drums and 18⅞" for 30-gallon drums. Rolls smoothly on five swivel 3" x 1." hard rubber casters. 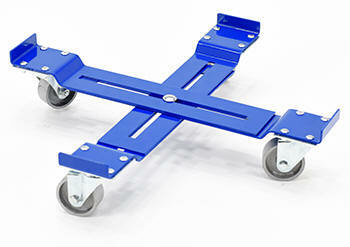 This cross arm dolly accommodates 30, 55, 85 and 95 gallon drums or adjust to fit multiple square and rectangular crates. 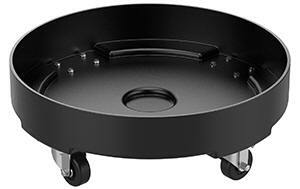 There are 4 (3") swivel casters. Blue baked-in powder coat finish for sustained toughness. Ships unassembled.